Recently I was given review access to a new YouTube marketing software offered for sale by Alexander Sebastian. He told me he wanted an ‘honest and brutal review’. So with a little bit of reserve I agreed , took my new access info and went over to his platform ready to tear it to pieces with my over analytical and quite critical way of looking at things. However I was surprised at what I found. From the moment I logged into the system I was hit with a sense of professionalism and quality. The design is clean and crisp. The interface is well laid out and intuitive. In the very first few minutes of using the platform it became obvouse that this was not some quickly made, hit and miss software that someone spit out to make a few quick sales. Its all to apparent that a lot of time, effort, hard work and Im quite sure money, was put into developing this project. As I dug deeper into its functionality I was extremely pleased to find that the quality of this product was not only limited to its design and interface. It is packed full of functions designed for anyone interested in YouTube marketing. If gives you tons of statistical data not only on your videos but also on the videos that other people make. The is an invaluable asset that will help assure that your videos are ranked high in the search results. 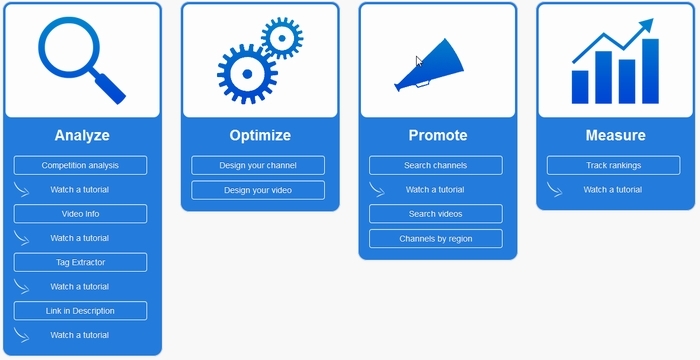 It also allows you to track videos rankings by keyword or phrase. But this is just the tip of the iceberg. There are so are tons of features inside of this platform. What I like best of all is that these features are all valuable assets. They are not fluff or hype just designed to make the software look good. They are things that you will use and that will bring real and true value to you. While developing and providing a crisp clean and useful platform is very cool one thing that is often left out is tutorials and training. Developers and platform creators sometimes forget that other people are not as savvy as they are. Im happy to report however that this is not the case with the TubeTrackr system. Each section has a readily available video tutorial that clearly describes how to use that sections functionality. Also there is an easy to reach help button on every page that will let you access support should you have any questions. I am one of your loyal customers, thanks for the honest review of this software. Please let us know when it is available I would like to purchase, thanks. Brett, I will definitely buy TubeTrackr …when you give me the ‘heads up’. Cheers mate!